During the Middle Kingdom (2133-1786 BC) Abydos was fully established as a city of prime importance and a place of pilgrimage. The 12th Dynasty pharaoh Senusert I erected a large edifice on the site of the earlier shrine at Kom el Sultan, which became known as the Temple of Osiris. Senusert III completely renovated it during his reign, and surrounded it with an enclosure wall. Influential noblemen were permitted to place stelae or erect cenotaphs near the sacred area. For it had become desirable to have a monument constructed at or near Abydos, in order for the spirit of the deceased to join in the annual dramatization of the life, death and triumph of Osiris, enacted by the priests. Each year, settlers would come from far and wide to see the ritualistic killing of Osiris by his brother Set, followed by several days of mourning. The people would show appropriate sorrow for the murdered god apd weep and lament in the manner of Isis. Funerary wreaths and flowers would be placed on a mummified figure of Osiris that was borne through the city. The cortege would be led by Wepwawat, the wolf-jackal, ‘He who opens the way’. The people would sing hymns ajid make offerings, and at a prescribed site a mock battle would take place between Horus and Set. The murder of Osiris was avenged, and the triumphant procession returned to the temple. The crowning scene was the erection of the backbone of Osiris, the Djed or pillar-like fetish. In horizontal position the Djed represented the slain hero and the low Nile. Upright it symbolised the resurrection of Osiris, as well as the flood and the rebirth of the land. One of the functions of mythology was to explain certain natural, social or political ideas. The mythical Osiris (who was associated with the rebirth of the land) falling victim to Set (who was associated with the relentless desert) explained the physical environment; the constant battle against the encroaching desert. Set’s tearing the body of Osiris to pieces and scattering its parts up and down the Nile valley may be interpreted as the concept of sowing grain, following which, with the necessary incantations (like those performed by Isis and Nephthys), or rural festivals, the stalks of grain would be reborn (as Osiris was reborn). Horus, the son of the gods related to the rebirth of the land, triumphed over the desert (Set) and became prototype of the pharaohs. In the Middle Kingdom the ordinary man could aspire to do what only members of the aristocracy had done before: pay homage to the legendary ancestor. Thousands of pilgrims from all walks of life made their way to the necropolis where Osiris was worshipped as ‘Osiris Khenti-Amentiu’, an epithet that means ‘he who rules the west’. Generation’s after generation’s offerings in pottery vessels were left at the cenotaph of Djer, which was believed to be the tomb of Osiris. Today the site has acquired the name of Om el Gaab (‘mother of potsherds’). To identify with the resurrected deity, it had long become common practice to place grain in a mummy-shaped linen container, water it and let it germinate through the cloth. This so-called ‘Body of Osiris’ was an example of his power to give life. It was believed that the mummy, like the grain, would revive. The cult of Osiris had thoroughly captured the popular imagination. The provincial priests who wished to give importance to their areas each claimed that a part of the body, dismembered by Set, was buried in their province. In one variation of the myth the head was said to be buried at Abydos. In another version it was the whole body that had been found there with the exception of the phallus that had been eaten by an Oxyrynchos fish. Abdu, Abydos, had by this time become the centre of the cult. It means ‘the mound of the Osiris head emblem’. During the New Kingdom (1567-1080 BC), Abydos rose to its peak as a holy city. This was the empire period, when the state could afford to be generous. Thutmose I ordered a barge of cedar and electrum to be built for Osiris, and almost every pharaoh of the 18th Dynasty left evidence of his devotion to the god, making additions to the temple at Kom el Sultan. Thutmose III, in particular, carried out new work and restoration; and Thutmose IV arranged for the regular supply of sacrificial animals and birds for feasts and festivals. Deceased noblemen from Thebes, the capital, were often borne, after embalming, to Abydos and placed in the precinct of the temple. Afterwards they were returned and interred at Thebes. If they could not make the pilgrimage, it was made symbolically; many tomb reliefs show boats bearing the deceased to Abydos (page iosf). In the 19th Dynasty, Abydos and its chief deity were honoured by Seti I on an unprecedented scale. He raised the three gods of the Osi/ian Triad (Osiris, Isis and Horus) to an even higher level than the greatest gods of the land (Ptah of Memphis, Amon-Ra of Thebes, and Ra-Harakhte of Heliopolis). He constructed a marvellous temple (4), with separate sanctuaries for each deity and with a seventh chamber, of equal size, to himself as a god (page 26). His son and successor, Ramses II, built a temple of his own (5) to the north (page 29). The decline of the cult of Osiris only came in the Graeco-Roman period (Part II, Ch. 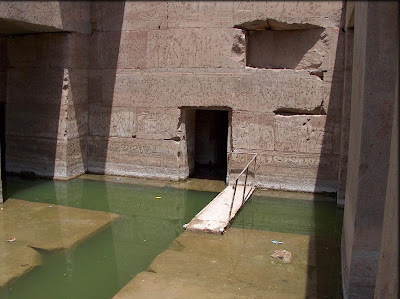 6), when the seat of Osiris worship was shifted to Bigeh Island, and that of Isis to Philae. This might well have been done in an attempt to break the power of the wealthy and influential priesthood at Abydos. Thenceforth the cult of Isis outrivalled that of Osiris. Philae became the most holy place in Egypt and the centre of the most popular cult (page 183). 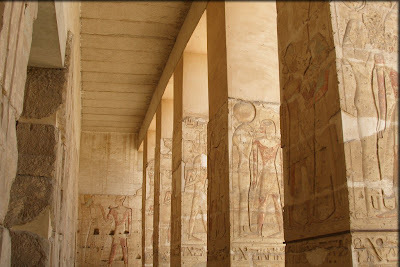 During the Graeco-Roman period, Abydos came to be regarded as a place of healing. Sufferers from all over the Graeco-Roman world gathered in the corridors and halls of the temple of Seti I, making humble pleas for health or fertility. The graffiti are in hieratic (a late development of hieroglyphics), Greek, Phoenician and Aramaic.